Brian and Katy Vaughn, co-owners of Low Country Kitchen locations in Denver and Steamboat Springs want to paint the Rocky Mountain region with broad, chicken-fried strokes. The husband and wife team has strong ties to a handful of Southern states, and successfully merges a medley of familiar flavors to create a down-home setting for summer staples. Although the menu is “bits and pieces from all over the South” the fried chicken is the main attraction and the perfect seasonal meal, especially coupled with their solid selection of sparkling wines. The Vaughns say they helped lead the widely-embraced trend of partnering the acidity and lightness of bubbles with supremely juicy and crispy breaded bird. The best-selling entree is available on brunch, dinner and happy-hour menus, with options to enjoy solo or share family-style with five to six hearty pieces and a bottle of brut cava. Low Country’s sought-after American indulgence is not attributed to a special blend of seasoning or a coveted family recipe, but instead utilizes preparatory procedures to lock in lusciousness. The all-natural, organic and Colorado-sourced chicken spends 24 hours in brine, then 24 hours in buttermilk and hot sauce before it’s ready to take a dive into the fryer. The recent opening of Low Country’s rooftop patio at the Denver LoHi location adds front-porch appeal, with zydeco music in the background and views of the Denver skyline. “Fried chicken and bubbles, summertime patios,” said Brian, who agrees that the framework simply mandates that folks have a good time. On Wednesday nights during the summer, a crawfish boil up top and inside the restaurant also offers an authentic experience. Mud bugs, potatoes and corn are strewn over a blanket of newspaper much like on a traditional Louisiana Saturday night. “We missed the food from our homes so we thought it would be something fun and there’s not a lot of Southern restaurants in Colorado,” Brian said. 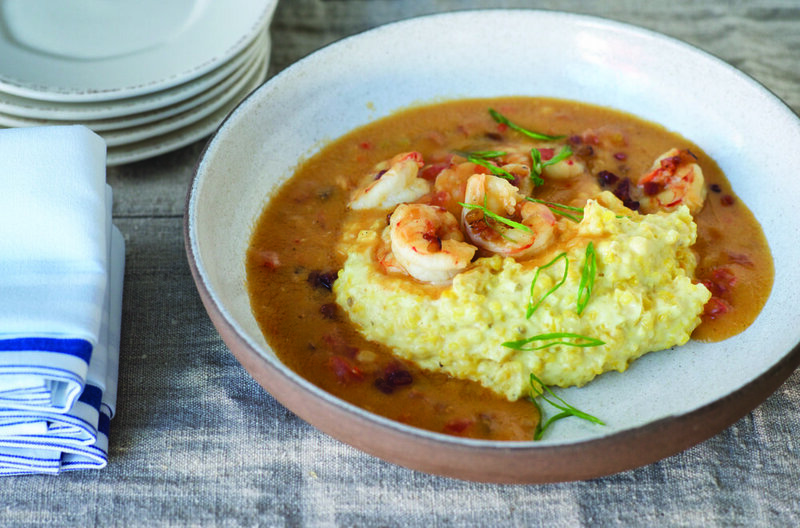 “You eat and it just brings you back to your childhood,” said Katy, who credits the Anson Mills antebellum grain for “a really nice, rich, thicker texture” that disproves that grits are runny and unpalatable. The Vaughns acknowledge some subtle differences in the menus in each city, which they attribute entirely to their “hyper-local” mentality. Low Country’s honey and dairy products are sourced in Steamboat Springs. Peaches, tomatoes, okra and corn are from Palisade. During the warmer months, they shop for additional produce for the Denver location at the nearby Union Station farmer’s market. “We source as much food as we can from Colorado while still keeping it Southern cuisine,” said Brian. The cocktail program is also consistent with the Colorado craft focus and leans heavily into whiskey, a nod to Brian’s preferences and a Kentucky lineage that traces back to Makers Mark. Clever names for handcrafted drinks include The Devil You Know and The Hemingway. Low Country Kitchen is at 1575 Boulder St., in Denver, and 435 Lincoln Ave., in Steamboat Springs.